Ask Tom: How Does Compost Tea Work? 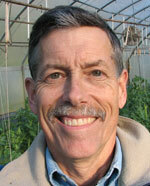 At the Organic Growers School Spring Conference I heard a lot of talk about compost tea. How does it work? Many recipes exist for compost tea but in general compost is put in water for a few hours or a few days to extract the chemicals and sometimes the organisms in compost. Some favor aeration such as with an aquarium aerator in a five gallon bucket. Others prefer an anaerobic solution. Some add nutrients for microbes such as molasses. Some do not. Compost tea seems to be gaining popularity compared to manure tea which is found in organic gardening literature going back for decades. Given the health issues related to pathogenic E coli and salmonella in manures, I recommend avoiding manure tea for use on food crops. Even with compost tea, the compost should be properly turned and allowed to heat to a level that will kill human pathogens. The National Organic Standards require a 120 day wait between manure application and harvest of a food crop in contact with the soil. In the early days of experimenting with compost tea, a theory was advanced that the microbes in the tea colonize the leaf surface to the exclusion of pathogens that arrive later. Some suggested first cleaning the leaf surface with a product like Oxidate (hydrogen peroxide and other ingredients) prior to spraying compost tea. Effective colonization seems unlikely to me since the environment of a compost pile is so different from a leaf surface. While some microbes are highly very adaptable, it seems unlikely that the wind and sunshine on a leaf surface will be a favorable environment for a soil or compost organism to thrive. More modern theories on compost tea mechanisms are more complicated, suggesting multiple modes of action. Serenade is an OMRI listed organic fungicide based on a soil bacterium – bacillus subtilis. While compost tea typically contains many organisms and their byproducts. Serenade is a mass produced population of this single organism that may be present in tea or may represent in some ways some of the microbes in compost tea. Here is a YouTube presentation that describes the Serenade manufacture’s theory on how it works. Another mechanism that may be at work is acquired or induced systemic resistance. As when our bodies respond to the arrival of a virus, for example, plants also have sensors that detect arrival of pathogens. Some organic sprays like Regalia are intended to trigger plant resistance before the pathogen arrives. 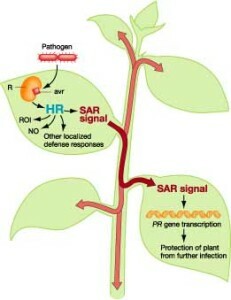 Even aspirin is thought to trigger resistance in some plants. This link and the graphic below describe these defensive reactions in more detail than is possible here. Another mechanism that may be at work with compost tea is providing missing micronutrients. While foliar or drench applications are an impractical way to apply N, P and K (plant macronutrients) tea may provide some micronutrients or growth stimulators. Since each batch of composts varies from the last, there may be more direct methods of solving nutrient deficiencies. For example SoluBor can add boron if that is the deficiency that you suspect. Tissue tests from NCDA may help with deficiency problem solving. Growers can make compost tea from on-farm resources or with compost acquired locally. Anecdotal evidence and some research suggest that compost tea is helpful for some diseases, in some locations, in some weather conditions. Tea may induce plant pathogen resistance. Making and applying tea takes time that is limited in the growing season. Compost usually varies from batch to batch so the plant response may be different with a new batch of compost and the tea produced from it. Poorly made compost (and particularly manure) teas may contain human pathogens carried over from the manure source that may contaminate food crops. I welcome comments on this topic if readers disagree or have other pros and cons to offer on this complicated topic. On our farm we see value in tapping these plant protection mechanisms but for now rely on products like BT, Serenade and Regalia because consistency from tank to tank is more assured than with compost tea.